The "Holiday in the Park" will feature a large tree structure made up of 70 Christmas trees each lit with 5 different colors. This 360° display will be located at the front entrance to the park and will feature the MidiLite system, strobes, LED fixtures and intelligent lighting. Its the most wonderful time of the year as Six Flags Over Texas transforms into Holiday In The Park, November 25 - January 2. Dont miss this truly unique one of a kind holiday spectacular. Six Flags Holiday Tree of Trees come to life nightly. Towering nearly 60 foot over the Star Mall, 70 Christmas trees trimmed with tens of thousands of lights, dance magically with computerized precision. 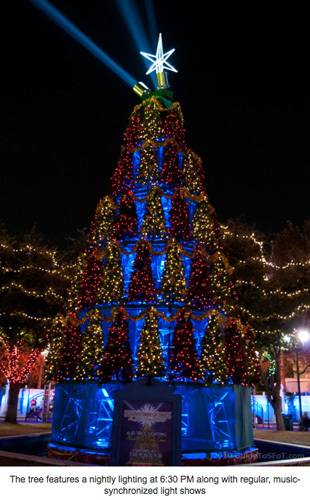 Choreographed to majestic holiday scores The Holiday Tree of Trees will become a must see family tradition.